Introducing 3D Wallpapers & wall coverings with beautiful designs at a highly economical price. The 3D wallpapers gives a real look and thrilling experience. There are many designs in 3D wallpapers. We have scenery, abstract, stones & bricks, bamboo and many more wallpaper designs. Get today the 3D wallpapers and ordinary price. Charlotte Wallpapers is from a renowned International wallpaper brand with highest quality standards. Charlotte Wallpapers is available in plain, patterned graphics, modern to classical, abstracts, children designs, theme walls & so on. Charlotte wall coverings are used for creating stylish interiors & adding life to monotonous walls of offices, homes, restaurants, bar areas, hotel rooms/ lobbies etc. Wallpapers comes in wide array of designs & colors & even for covering special areas like fire retardant areas. Charlotte Wallpapers are widely used due to their low maintenance cost, high durability and variety of stylish looks. With an objective to cater the required expectations of our esteemed clients effectively, we are engaged in providing Modish Wallpapers to the clients. Modish Wallpapers are designed and developed in accordance with the globally accepted quality standards. For their matchless quality, the provided products are highly demanded in the market. Modish Wallpapers products are available with us in numerous designs to our valuable customers. Balanace corporate Wall Coverings is a most economical wall coverings for larger areas. The designs look simple and elegant. This wallpaper designs can match with other designs like floral wallpapers to bring rooms much brighter for residencial purpose. It has got 8 different style with 6 colours in each designs. 100 Pipers Wall Coverings has collections that suits your residence or villa. The wall papers in this catalog is more colourful that suits very well for hall, bedroom, living room and dining room. The price is nominal and as it's vinyl coated, it fully washable and scratch proof. Dynamic Wall Coverings is one among the fast moving designs. There are designs like abstracts, stones, pebbles that look very natural. King is 3D Wall Covering with heavy vinyl coated and looks very rigid. The design looks great for bigger size walls. The designs includes flowers, jute designs and abstract. King wallpapers comes in more than 50 designs. There are nearly 80 designs to select from. Now, you can decorate your room with exotic designs of wall papers. The canon wallpaper gives a mat look and feels like a fabric. This helps the design of the wallpaper to look as natural. 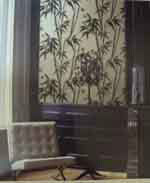 The bamboo design with 4 colours, black, green, brown and gray gives more choice to design your room with a theme. The bamboo design gives a feel of outdoor. The flowers, with a large size print, wonderful colours and a mat print feels great to design your home. Three different products are combined in this Omexco wallcovering collection : a printed non-woven wallcovering, 1 m wide, with a very resistant and washable coating. The non-woven wallcovering is ecological and carries the FSC label. glass beads strewn on a glossy non-woven backing. and, finally, the product which gave the name to the collection : a mixture of tiny mica particles, “mica sparkles”, and recycled paper. “Manhattan”... a “vertical” skyline with skyscrapers in different heights and widths... a place bubbling with energy and activity... and, also, the name of Omexco’s stripe collection. Not only the colours and widths of the stripes differ, but there’s also a great variety of the structures and materials chosen, in various combinations. “Manhattan”... a “vertical” skyline with skyscrapers in different heights and widths... a place bubbling with energy and activity... and, also, the name of Omexco’s stripe collection. Not only the colours and widths of the stripes differ, but there’s also a great variety of the structures and materials chosen, in various combinations.